Y'all know that this is the time of year that our family usually spends lots of time at the baseball field. It is wonderful to support your child in something that they love, and I wouldn't have it any other way. But...I have to admit that I love a little bit of rain when I'm really itching to get a quilt finished. I made the most of Saturday's rainout, and just had to wait for the ground to dry out a little bit for some sunshiny photos. I had so much fun creating this design, and even though I think it really glows in solids, I think that tonal fabrics with solid centers would look equally cool. I really worried about the darkest gems overpowering the quilt (particularly the garnet one, because I thought it may look too brown). All in all though, I think they add a lot of depth. I struggled with the binding choice with this one. I really wanted to use fabric from my stash, and I had enough of the Kona Royal. I actually made the binding with the Royal, but it just didn't feel quite right. I ended up going with a black binding, and it just makes the colors sparkle. The black had to be purchased, which was a bummer, but I'm much happier with the result. Gray and black are always my go-to backing colors when I'm working on a quilt with all of the colors of the rainbow, but I've never done a black binding (though I have done charcoal gray). It's always hard for me to choose another color. I know this is overthinking things, but I worry that choosing a single color from the front will throw off the color balance in the quilt. It just feels like gray and black belong there, and set the colors off without competing with them. The backing is pieced with one of my most favorite gray fabrics in the world- Cloud 9 Cirrus in Shadow. I love the dimension that the shot cotton gives the quilt, and it is ultra soft. The other fabric in the back is from the Crystalia collection by Hoffman. The other fabrics in the Crystalia collection aren't my style, but this one is so neat. It looks kind of like an abstract skyline. The colors and pattern in this fabric are really amazing, but as much as I love it, it's one of those fabrics that is difficult to mix with others, because (to me) it feels so edgy. I looked at this fabric online for a looong time before I bought it, and when I couldn't stop looking at it, I finally decided to just buy a yard and quit obsessing over it. It's so different from my usual fabric choices, and I had no idea what I would do with it, hence the reluctance to actually buy it. I'm so glad I did though, because it's the perfect compliment to all of the solids on the front of this quilt. I am working on the pattern for this one, and I hope to have it finished for you soon (by the weekend, if I can manage), so be on the lookout! Edited to add- so sorry I forgot to add that this quilt is 64" x 66"! On an unrelated note, Facebook has just informed me that today marks my three year blogging anniversary. Thank goodness for the photo memory pop-ups, or I wouldn't have even realized it! 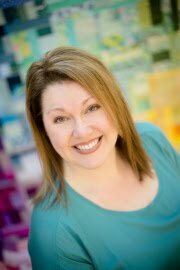 It is so hard to believe that only three short years ago, I started this blog so that I could meet friends in the modern quilting community; and boy oh boy, I have certainly done that! I love quilting, and it makes me so happy to share my quilts through this blog. The modern quilting community is such a blessing and a source of inspiration for me, so I want to say thank you! As a thank you, and to commemorate my three year blog anniversary, I am giving away a PDF pattern to three readers. You can choose any of my patterns, including Birthstones! Just leave a comment on this post to enter (one entry per person, please). I'll announce the winners on Saturday! It's beautiful. The colours are so rich and vibrant. Happy Birthday! Thanks for the chance to win a pattern. Oh goodness I LOVE Birthstones! Congratulations on your blogiversary! Thanks for the chance to win! I'm so glad you started your blog! I love your quilting style. OMGosh!!! I am in love with your Birthstones quilt!!! That would be my choice if I should be chosen to win your wonderful giveaway. It is so bright and colorful and perfect for one of my grandchildren for Christmas. Congrats on three years!!! Happy anniversary :-) Blogging is a fun way to make friends and get inspired. Your Birthstones quilt is gorgeous in all those pure colors. There are probably a lot of variations for this that will be lovely. Congratulations on your blogiversary! I really love that colorful print on the back, it's a great choice to reflect the colorful front. Another great quilt. This quilt is very nice, too! What are the dimensions of the quilt? Also congratulations on your blog birthday! 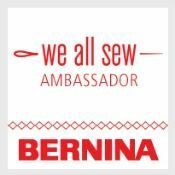 Thank you, for inspiring the rest of us and for the opportunity to win one of your patterns!!!! I love the Bauble pattern! Birthstones is simply lovely!! Congrats on your 3 year blogiversary! Wonderfully quilt, love the bright colors and design. Congratulations on the finish! Black for the binding was a great choice. And congratulations on your three-year anniversary!! Glad to have found you online. A beautiful quilt! Happy Blogiversary! Congratulations on your blogging anniversary. I would love another one of your patterns. I already have two. And I already have the solids! 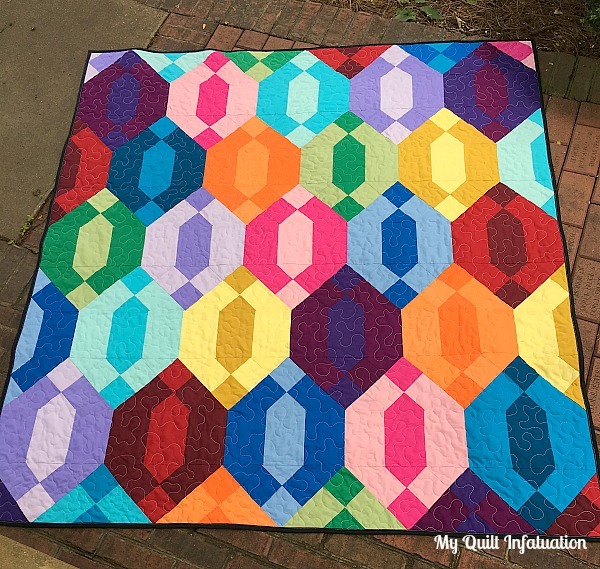 Birthstones is such a beautiful quilt! Congratulations and Happu Blogversary! Three years. Congratulations. 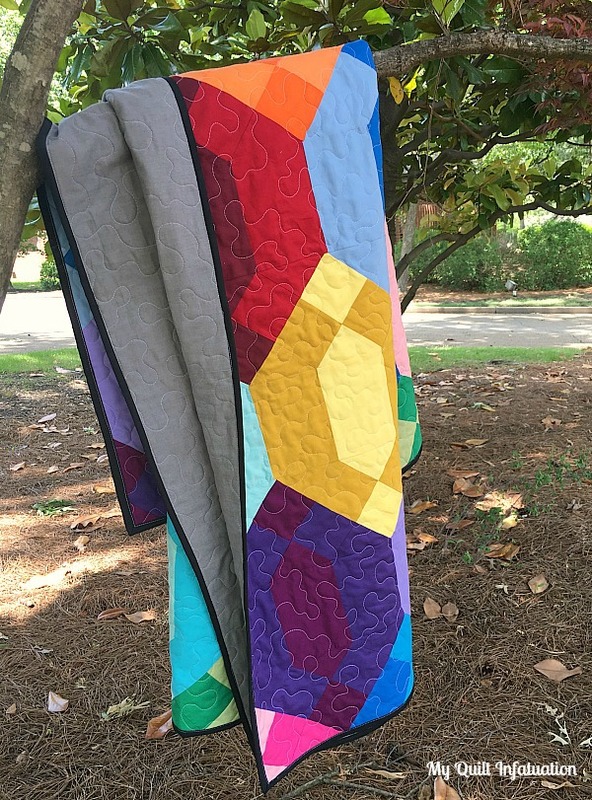 Birthstones is a beautiful quilt! Congrats! I love this pattern, and I love the idea of using that unique fabric in the backing! Very clever pattern and looks gorgeous in solids! Happy anniversary and thanks for the chance to win. Also, I think that black binding was a fantastic choice. Those birthstones really POP! Thank you for sharing your art, so that we might share it.....and on it grows! Congrats to you on three years of blogging. That certainly takes a lot of commitment. I think I would have to choose the new pattern too. Looks very beautiful. Plus, I love solids. Always look forward to a Bloglovin update from you. This quilt is a beauty! Wow, only three years. It seems like you've been around lots longer than that with the amazing quilts you make. Congrats on the upcoming pattern! Yes, congrats on 3 years. 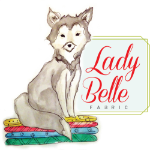 I do so enjoy your blog, and would love to win a pattern. The Birthstone quilt is gorgeous. Garnet is my birthstone, and it really is a dark blackish-red, unlike the bright July ruby. 'Still pretty though. Happy blog anniversary. I love your patterns, I'm currently working on Stems and stones. Congrats! It will be hard to pick which pattern--they are all amazing. Congratulations on three years. If I am so fortunate, it will be Birthstones that I will pick. Thanks for the giveaway. Love your new pattern design, but I still think Carrelage is my favorite! Thank you for chance to win your Give-a-way!! Happy 3 Years!!! Happy Blog-iversary! I love reading your post and seeing your quilts. They just are amazing! The Birthstones Quilt is so so gooood! HAPPY ANNIVERSARY! Thanks for the generous giveaway, as well as continuing your wonderful Blog which we all love and adore!! Keep up the good work. Happy Anniversary! I really love the colors, they make the pattern just pop. Congratulations on three years! Love the colors in the Birthstones quilt. A very Happy Anniversay! Congrats on your third year of blogging! Your Birth stones quilt is lovely. Congratulations on your 3 year milestone. Happy third year blogaversary! Love all your patterns. This is a great quilt! And the backing fabrics are perfect with it. Congratulations on three years of blogging. 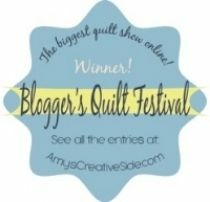 I'm fairly new to quilting and am loving following the blogs of many modern quilters. 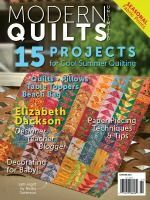 A great way to see what's going on in the world of quilting! 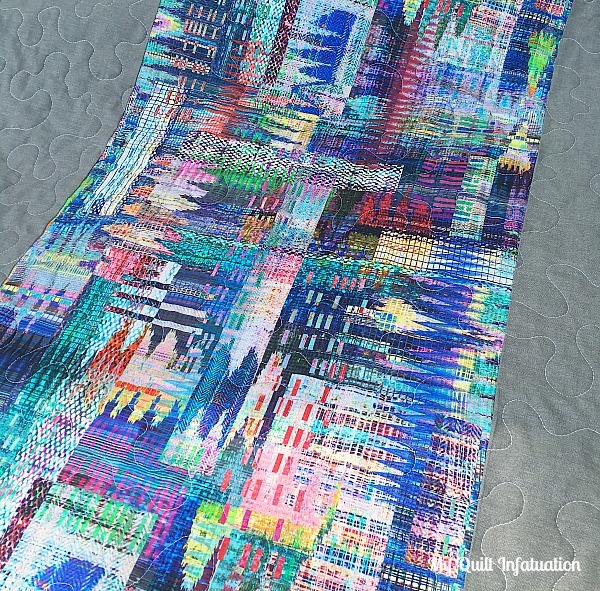 This quilt, as all your designs, is beautiful. I don't know how you come up with your many ideas. Keep up the great work! Congratulations on three years! I don't have a blog, but know it takes lots of time to maintain one, and add to that all the patchwork and quilting you do and share, and that's a lot of work. It is very appreciated. I've been a traditionalist for a long time, and your blog is helping me move into a more modern frame of mind, and that too is much appreciated. Your designs and color sense are very inspiring. Thank you! Congrats on your three year milestone! 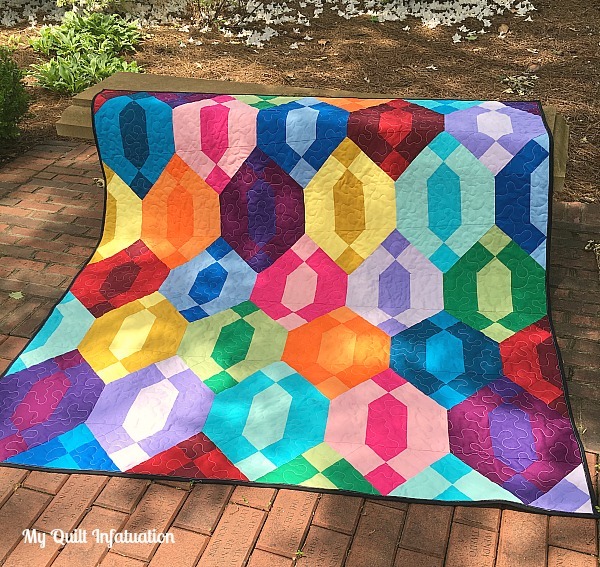 I love your bright quilts! I would like to thank you for blogging! I really enjoy your posts, and your quilts are always beautiful! Thanks for inspiring us! Congratulations on your three year anniversary, and best wishes for many more! Your quilts are beautiful, and your tutorials, commentary, and patterns are a great help and inspiration. Congrats on 3 years! I enjoy your blog. Black binding is gorgeous, especially on the flip side w/the skyline. Cloud 9 organic solids are so luscious and that shot cotton weave really is beautiful on your Birthstone quilt. Thank you so much for all your posts, they are so uplifting and fun. Glad I found your blog about 1.5 yrs ago. Birthstones and a 3-year blogging birthday… they go together nicely! Congratulations! I love your blog and have learned so much. You make quilting - the whole process - so accessible. And your Birthstones quilt is gorgeous - front and back! 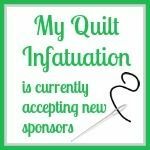 I always enjoy reading your blog and you always seem to get your quilts done so fast! Congrats! Hey Kelly!!! Happy Anniversary! Such a good milestone! The Birthstones are gorgeous! I love seeing your posts and your quilty goodness!!! Birthstones are perfect for a birthday/anniversary! Lovely quilt! HAPPY BLOGAVERSARY. your quilt is fabulous. i love the back fabric. it is such a complement to the front fabrics. The birthstone quilt is wonderful!! Such a great use of solids - I love it!! Happy anniversary. I have truly enjoyed your blog. Keep up the good work. Beautiful quilt to celebrate quilting! Love your quilt and good for you blogging now for 3 years!!! Wishing you many more blogging years! Love reading about how you design and choose colors - very inspiring. Birthstones is fabulous! Congrats on your anniversary! Loving the new Birthstones in solids - great job! Congrats!!! I love your patterns, and you do an awesome job of color choices, the black binding was a great idea. I love this and the black binding was a perfect choice for this quilt. Congratulations! I loved your Bubbles quilt pattern so would be more than happy to try another one. Love your finish - that "busy" fabric on the back really adds to the front! I'd love to do this pattern!! Thanks for the give-away. Congrats on 3 years, time flys! Love this new quilt, the colors are so wonderful. The design is perfect! Congrats on your anniversary! Another beautiful quilt design! We must have similar taste because every one you make reaches out and screams "make me, make me"! Thanks for the chance to win one of your gorgeous patterns! Oh my, how I look forward to Wednesday's to check My Quilt Infatuation and see what you and your sewing machine are up to. I'm never disappointed. Good work. Would love to win a pattern. Love your new quilt. And congratulations on your blog anniversary. Kelly, I have enjoyed your blog very much. Your original patterns are very inspiring, as well as your sunny outlook on everything! Congratulations on your three year anniversary. I'm looking forward to more beautiful quilts and posts from you! Congratulations! I love the new quilt. Happy 3rd Anniversary!!!! I so enjoy all your quilts - all so bright and happy. Love the Cloud 9 gray - I must look for this fabric. The black binding is perfect! Thanks for sharing! Birthstones is brilliant! The darker blocks look wonderful. This is beautiful! Wonderful down to the last detail. First time on your site and I must say, I'm impressed. Love your patterns especially done in solids. Happy third anniversary! I love this quilt. It is such a happy joyous quilt! Just the thing to brighten a gloomy rainy day in NH. Wow! Your quilt is amazing! Love the bright colors. Happy Blogaversary! Great quilt, I love the colors you chose. Congratulations on your 3 year Blogiversary! What a milestone, that is a labor of love. Thanks for sharing your talent with all of us. I love your work. Thanks for the opportunity!! What a gorgeous quilt! The colors are wonderful. Congrats!! Three years is a nice long run. I am coming up on two years. Crazy how fast it goes by. I do appreciate your site and all of the inspiration you provide! Congratulations! 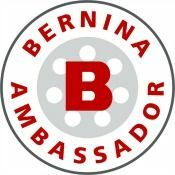 I love your blog- so attractive and full of amazing information! I love this quilt, I particularly like the quilting which with a contrasting thread makes a real feature. Another great pattern Kelly! I think it was very wise to keep the garnet; you are right in that it really adds depth. It's very generous of you to give away three patterns. Thank you for the chance to win one! 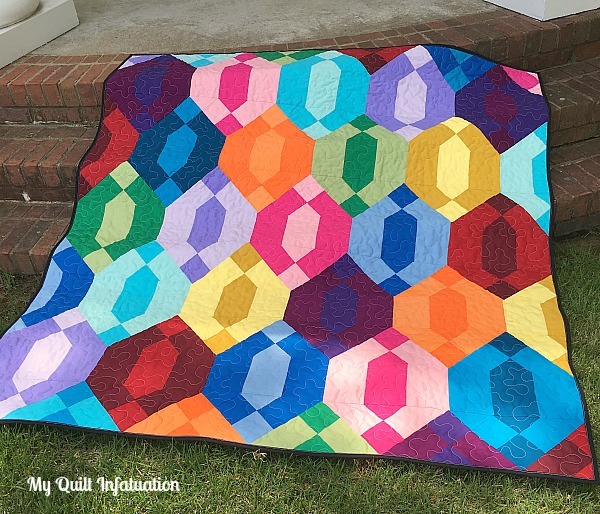 Birthstones is a beautiful, beautiful quilt! I do like your choice of black binding on this quilt. I often struggle with what color to use too...will have to re-think my choice of black from now on! I'd be happy to win one of your gorgeous patterns! It's not often that I see you use all solids in a quilt and I think this pattern was the perfect choice. Congrats on the 3 year anniversary! 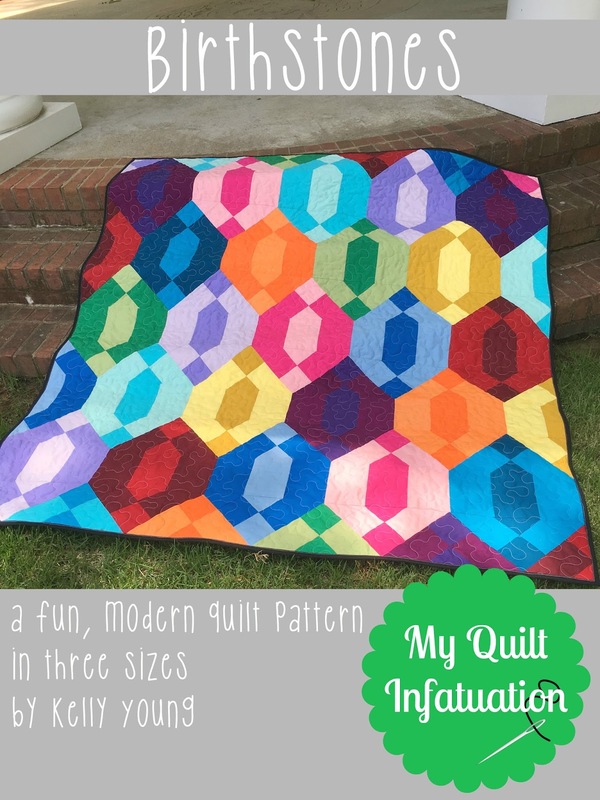 Birthstones is a gorgeous quilt! Happy 3rd Anniversary and thanks for the chance to win the pattern. Happy Blogiversary! Your Birthstones quilt is stunning! You're 3 and growing. Happy Blog-Anniversary to you! Congratulations on three years. Woo hoo! Congrats on you Blogiversary! 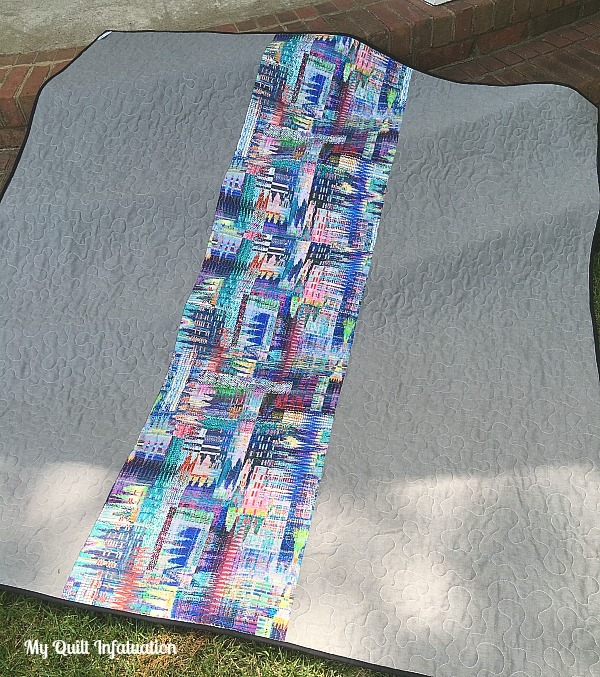 You quilt is so colorful and fun, Love it. Thanks for the chance to win. I love the beautiful colors of the Birthstone quilt. I'm new to your blog and am enjoying it very much! Congrats on three years of blogging. Beautiful quilt, bright and colorful. Happy Blogaversary! I love Birthstones! All those beautiful solids...pitter patter! Congrats on your three year anniversary. You took the blogging world by storm and there was no looking back! Happy blogiversary! I love all your patterns Kelly! This one is definitely one of my favorites. Happy Blogiversary! I do love your blog! 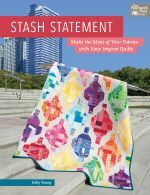 I really like your quilting style...and that is why I already have one of your patterns (Baubles) and I am using only Tula Pink and Kaffe Fassett fabric to make. Thank you for this giveaway! I am so glad to have found your blog, it is very inspirational. I love seeing your new creations and all that you share with us in blogland. I am looking forward to all of your coming creations. Congrats on your staying power. I always look forward to reading your posts. 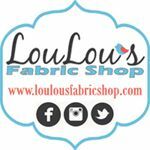 Thank you for the chance to win one of your beautiful patterns! Congrats on your three-year anniversary! (I'm coming up on four!!) I don't remember how I discovered your blog but it is one of my favorites. Here's to more wonderful posts and more fabulous patterns!